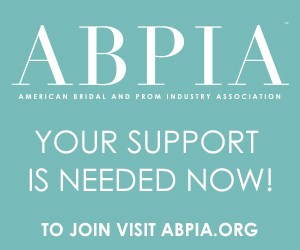 In contrast to David's Bridal, the financially troubled national bridal chain, independent bridal salons see growth in today's challenging retail climate, according to a report from the Better Bridal Group (BBG), an organization of over 200 locally-owned salons across the US. Quoting from the 2018 Wedding Attire Study from TheKnot.com, which shows that the brick and mortar bridal salon industry has grown to represent 69% of all bridal gown sales in the US, up from 58% in 2011, BBG co-owner Michelle McFarland suggested that independent bridal salons are poised to grow even further with the help of an improving economy and a new generation of strong, savvy local wedding shop owners highly focused on trends, business practices and customer service. "The independent bridal salon industry is in a generational shift. These new sales figures show that the continuous improvements savvy brick and mortar bridal shop owners are making appeal to their local brides over national chain stores and online sales. Brick-and-mortar bridal salons provide exactly what regional brides want. 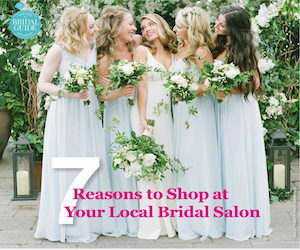 A unique, personal experience from a locally-owned bridal salon that supports their local economy and has a stake in their local community," states McFarland. "Independent bridal salons across the country are much more nimble than big-box chain stores or online sites. They are quick to make improvements as customer demands change. Utilizing better business practices, implementing core education and working with production partners to offer customization. Brides are recognizing, now more than ever, that locally-owned bridal salons provide the personalized customer experience they need and desire." Contrary to many reports, David's Bridal is not losing sales to online sites, she added. Rather, it is the increased sales at independently-owned bridal salons that is gaining traction. As brides continue to seek more of an "experience" while shopping, undertrained and overworked employees at big box stores cannot compete with independent retailers. And brides see impersonal online sites as too big of a risk for such an important purchase. According to The Knot's study 22% of gowns sales were in chain stores, down -11% from 33% in 2015. And online purchases, which include everything from online only retailers, specialty store websites, user-to-user sites and national chain bridal websites, only represents 7% of bridal gown sales, down from 8% in 2015.